Temporary files are generated when users are creating a new file, and their role is to temporarily retain information until the file users are working on is saved. Temporary files should be deleted from time to time, otherwise, they unnecessarily load your computer’s drive, reducing your system’s overall performance. However, there are situations when users cannot delete temporary files. This is quite a complicated situation because temporary files can sometimes use even hundreds of gigabytes of your computer’s memory. here you can see in this snapshot that there is 5.49GB temporary files. but I’m unable to delete them I had tried this serval times but its not performing any deletion operation. it shows that we are cleaning up your temporary files come back in a bit to check out result. but no result I got. kindly help me to solve this issue. my c driver is getting full day by day. Users tried various methods to clean temporary files: ranging from running the Disk Cleanup Wizard to performing clean boots and drive error searches, but nothing worked. 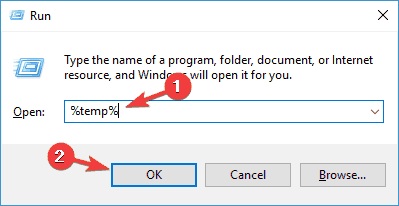 If you’re having trouble deleting temporary files on your Windows 10 computer, follow the steps listed below to solve this problem. Can’t delete temporary Internet files Windows 10 – If you’re unable to delete temporary Internet files, you might be able to do that using Disk Cleanup tool. Delete temporary files Windows 10 manually – Advanced users prefer solving issues on their own, and if you’re an advanced user, you can delete the temporary files manually. There are several locations that hold your temporary files, so you can delete them with ease. 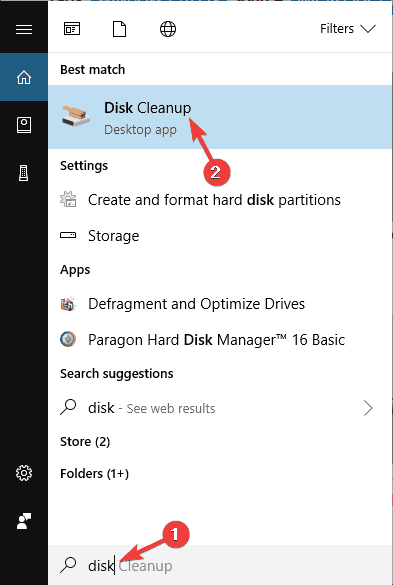 Disk Cleanup won’t delete temporary Internet files – If you can’t delete temporary Internet files with Disk Cleanup tool, you might be able to fix the problem by using a third-party application. Unable to delete temporary files Windows 10 – Issues while removing temporary files can appear, but if you encounter any issues, you might be able to solve the problem by using one of our solutions. Temporary files not deleting – According to users, sometimes your temporary files can’t be deleted. This is a strange issue, but you can solve it by removing those files from Safe Mode. Type temp > click OK.
Press Ctrl + A > click Delete. Type %temp% > click OK. 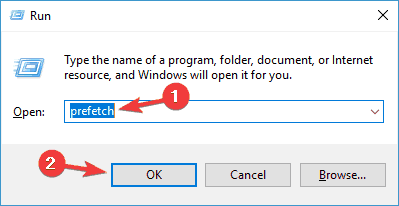 Type prefetch > click OK. Select all > click Delete. 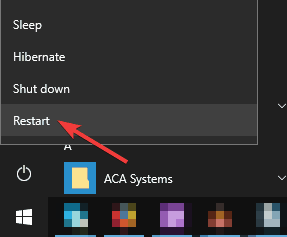 When using the delete option, you can also press Shift+Del, instead of a regular delete, to permanently delete files, and not just send them to the recycle bin. If I am wrong and Microsoft is working on solving this problem, then enlighten me regarding what is being done and I will gladly stand cotterted. Press Windows Key + S and enter disk. 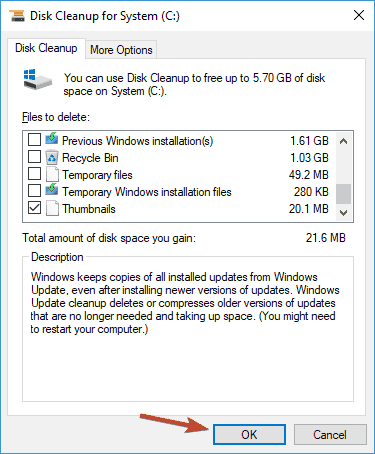 Select Disk Cleanup from the menu. 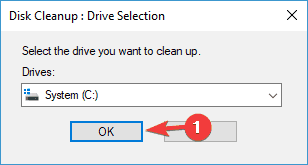 Make sure that your System drive, by default C, is selected and click OK. Wait while your PC scans the C drive. Select the files you want to remove and click OK. 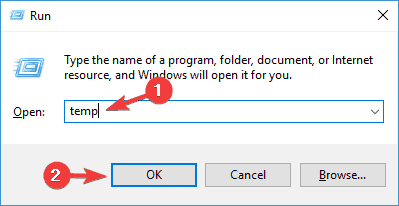 If you want, you can click Clean system files button in order to remove additional files. After doing that, the temporary files should be removed and you’ll free up some space on your system drive. When Command Prompt opens, enter del /q/f/s %TEMP%* and press Enter to run this command. Once the command is executed, all your temporary files should be deleted and the problem will be resolved. This is a quick and relatively simple solution, and if you don’t want to delete your temporary files manually, be sure to try this solution. If you have problems with temporary files on your PC, you might be able to remove them using a third-party application. There are many great tools that can help you remove junk files, but two of the best tools are CCleaner and AVG TuneUP. Both of these tools are simple to use, and while CCleaner can remove temporary files and clean your registry, AVG TuneUP will remove the temporary files and optimize your PC. If you don’t want to clean temporary files manually or if you have any issues with removing these files, be sure to try one of these tools. Several users reported that they had issues finding the temporary files that take up the most space on their PC. If you have this problem, it’s advised to use a disk space analyzer software. These tools will scan your drive and allow you to find files that take up the most space. 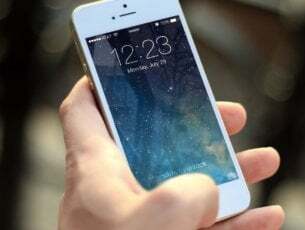 According to users, they managed to fix the issue by using Glary Utilities software to scan their system drive. After scanning the drive, they managed to find the temporary files that use the most space and delete them successfully. According to users, sometimes the inability to remove temporary files is caused by a bug on your system. Bugs can interfere with your system and prevent you from performing certain operations, therefore it’s crucial that you keep your system up to date. 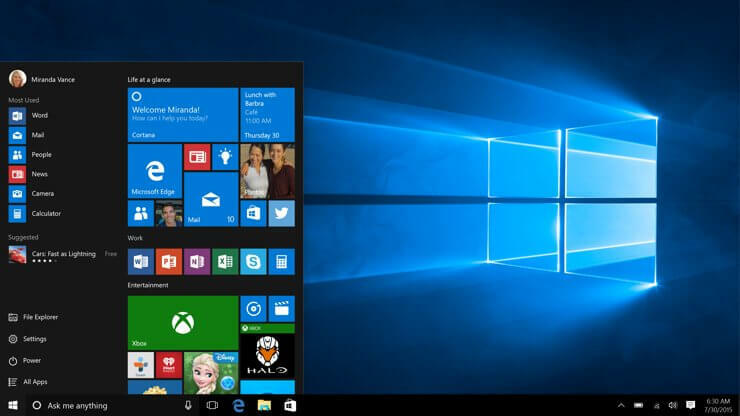 Windows 10 will check for available updates. If any updates are available, they will be downloaded automatically in the background. As for the updates, they will be installed as soon as you restart your PC. Once your PC is up to date, the problem should be resolved and you’ll be able to remove temporary files without any problems. Several users reported that they are unable to delete temporary files due to SoftwareDistribution directory. This folder holds Windows Update files, and sometimes it can prevent you from deleting certain files. Make sure that Windows Update isn’t downloading any updates. To do that, check for available updates. If no updates are available, you can proceed to the next step. 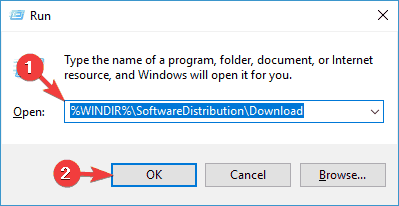 Press Windows Key + R and enter %WINDIR%SoftwareDistributionDownload. Press Enter or click OK. Select all files inside of Download directory and delete them. After doing that, you should be able to remove temporary files without any issues. 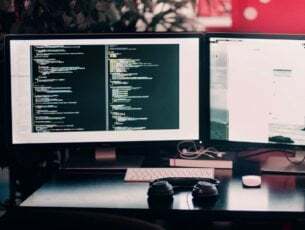 According to users, sometimes third-party applications such as Skype and Spotify can interfere with your system and cause problems with temporary files. According to users, the issue started appearing after an update installed these two applications automatically. Open the Settings app, and go to Apps section. List of installed applications will appear. 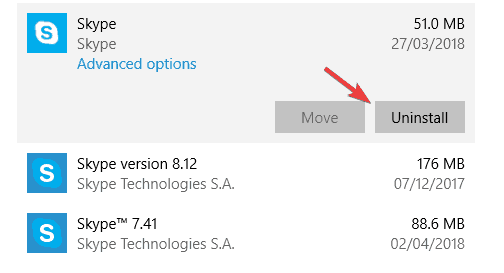 Select Skype on the list and click Uninstall. Now follow the instructions on the screen to remove the application. Repeat the same steps for Spotify app. This is a strange problem, but several users solved it by removing these two apps, so feel free to try it out. Open the Start Menu. 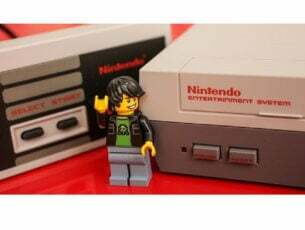 Click the Power button, press and hold the Shift key and choose Restart from the menu. Once you enter Safe Mode, you should be able to remove temporary files without any issues. Not being able to remove temporary files can be a big problem sometimes, but you should be able to fix it with one of our solutions.